Sundays are for pampering your tired bodies that have laboured through the week, cheating on your diets and indulging in some much-needed foodgasm. 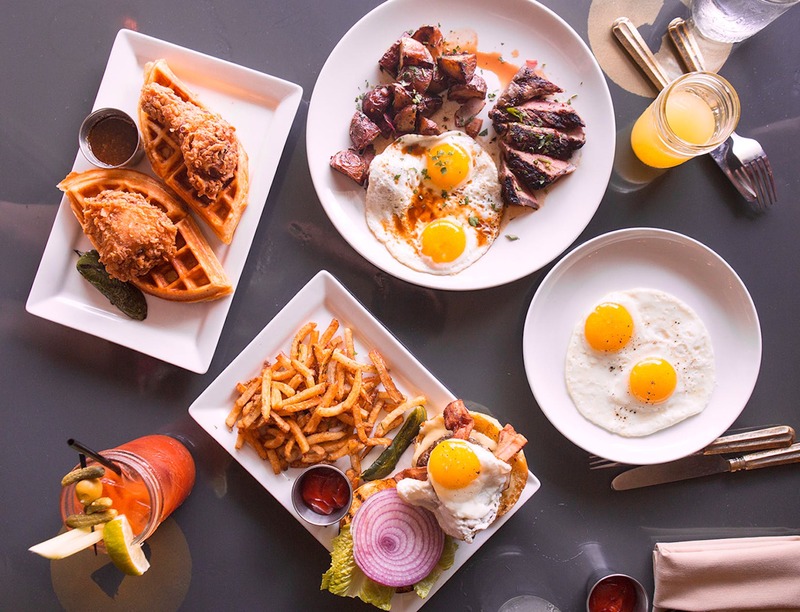 Take your pick from these awesome Sunday brunches that the city has to offer. Grid is a microbrewery and a gastro pub, but it organizes a special Sunday buffet every week with a globally inspired menu that has something for everybody. Sunday brunch with The Grid is like a carnival with fun activities for kids and about 90 exotic delicacies for adults. They keep changing and innovating the buffet menu every week. On the drinks menu: homemade beers, red and white wine and cocktails with vodka. Brunch is spread out between 12pm to 4pm, and it's priced at INR 1,500 with unlimited food and alcohol. Obviously it'll be sinful to miss out on this one. The Fatty Bao has Sunday brunches and its everything you’d expect from the town’s favourite jaunt and more. Choose from sushis, baos, dimsums, soups and salads. Though their Sunday brunch menu has their signature cuisine and style, there are certain new additions that you wouldn't want to miss. Start with their cocktails 'Beat The Heat' and 'Call Me Rose' (they are just so tasty!) and then go on to steamed tofu with crispy sesame lentils, prawn tempura sushi, California rolls and much more. Brunch is available between 12 pm to 3:30 pm, and it will set you back by INR 1,400 (without alcohol) and INR 2,600 (with alcohol). Although the focus is on healthy food, The Salt House's spread works out for a wonderful indulgent Sunday brunch. Besides the marv rooftop to soak up the sun, there are truffled eggs, cream-cheese akuri on toast, avocado, spicy salsa tartine and meaty club sandwiches on the menu to make it a swell weekend. And if you accidentally pig out a lot, balance it out with their fresh fruits and fruit smoothies. The early brunch is set out between 8 am to 12 pm. The meal will cost you INR 1,800. Italian cuisine is La Cucina’s speciality. The restaurant offers the perfect setting to enjoy a lovely brunch with your better half surrounded by soft lights and soulful music. Add to that love affair - delectable cuisines and a sumptuous spread. Think, Four Cheese Pasta, Spinach Ravioli, Cannelloni, and Chicken Roulade. Don’t miss out on the freshly baked pizzas served hot on the table. The dessert table displays eight to ten heavenly treats that include Tiramisu, Apple Tart, Pannacotta with Raspberry Coulis and more. Brunch is available between 12 pm to 3.30 pm, and it will set you back by INR 2,550+ (with alcohol). Right in the heart of the city, the rooftop lounge restro Deck 88 hosts Sunday brunches, the kind where you tend to over-eat. They start off with three kinds of mocktails and the rest of your meal includes salads, grilled choices, pasta and Chinese faves, ending with lip-smacking desserts. They don't provide alcohol in this package, however, you can buy your alcohol, independent of the brunch cost. If you're coming with a large group (about 8-10 people), make sure to call one day in advance and book your tables. The meal will set you back by INR 1,600. Inform your family of a perfect family brunch plan and just take them to Novotel. At The Square in Novotel, enjoy a meal of multi-cuisine buffet, a separate buffet for kids and a range of specially-made cocktails. While you're at it, occupy yourself in their magic shows, play station, activities for kids and a live band. You've got to be here between 12pm and 4 pm for the brunch. It will set you back by INR 1,449 (without alcohol) and INR 1,649 (with alcohol). JW Marriott hosts an elaborate Sunday brunch with more options than you can eat at one go. The menu is multicuisine, and you'll get to stuff yourself on a humongous spread of veg and non-veg dishes. Soups, salads, starters, main course and dessert, you won't want to leave out anything. They also have fruits on their buffet menu. Brunch is spread out from 12:30 pm onwards. It will cost you INR 1,699 (without alcohol), INR 1,999 (with alcohol) and INR 2,999 with champagne. If you can't decide what you want to eat this Sunday, go to Westin - they'll surprise you. With a altering menu for their brunches, they have a different dish assortment for each week. It ranges from Bengali to Asian, continental and others. Choose from a lavish spread of various live counters, a score of veg and non-veg appetizers, around similar numbers of main course options, salads, soups, chaats etc. Every brunch has a special roast or turkey on the menu. Brunch is available from 12:30 pm onwards for INR 1,599 (plus taxes, without alcohol). Afraa’s Sunday brunches are spread across two floors. The starter section is on the 6th floor with an array of mezze platters, salads, cured meat platters and more with drinks. The main course is set out on at the 7th floor, where you can choose from the likes of Dukka Spiced Fish and Persian rice, Moroccon Lamb Tangine and several more dishes. Desserts include tiramisu, apple crumble tart and more. The spread is available between 12pm to 3:30 pm and is priced at INR 1,399 (with unlimited alchohol). Indulge your palates in a variety of sumptuous Mediterranean food filled with tantalising flavours at the Souk. The mesmerizingly romantic ambience will ensure you have a great time with your loved one. Their specialties include Baklava, Shawarma, Grilled Fish with Okra and Grilled Chicken that are worth remembering for its unique flavours. End the bingeing at a counter laid out with (what seems like) a million mini desserts. Brunch timings are from 12:30pm to 3:30pm, and it will set you back by INR 1,750+ (inclusive of beer, vodka and sparkling wine). True to its name, it does successfully bridge the gap between hunger pangs and its utmost satisfaction. Their specialties include a live counter for starters, huge variety of salads and soups, a chaat counter, multi-cuisine main course spread and a dozen sinful desserts to satisfy your sweet tooth. Don’t miss out on the biryani, which is a constant on their menu. The brunch is available between 12:30 pm and 3.30 pm for INR 1,800+ (without alcohol) and INR 2155+ (with alcohol).